^ Britton (2003) p. 41. ^ Berg (2004), p. 40. ^ Chandler (2011) p. 30. ^ Higham (2004) p. 4. ^ Hepburn (1991) p. 46. ^ Chandler (2011) p. 6. ^ Higham (2004) p. 9. ^ Higham (2004) p. 21. ^ Berg (2004) p. 118. ^ Higham (2004) p. 10. ^ Chandler (2011) p. 54. ^ Curtis (2011) p. 718. ^ Hepburn (1991) p. 393. "I virtually quit work just to be there so that he wouldn't worry or be lonely." Bacall, Lauren (2005). By Myself and Then Some. London: Headline. ISBN 0-7553-1350-X. Berg, Scott A. (2004 edition [First published 2003]). Kate Remembered: Katharine Hepburn, a Personal Biography. London: Pocket. ISBN 0-7434-1563-9. Britton, Andrew (2003 edition [First published 1984]). 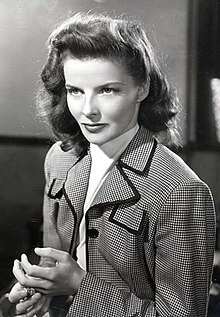 Katharine Hepburn: Star as Feminist. New York City, NY: Columbia University Press. ISBN 0-231-13277-8. Chandler, Charlotte (2011 edition [First published 2010]). I Know Where I'm Going: Katharine Hepburn, a Personal Biography. Milwaukee, WI: Applause. ISBN 1-907532-01-3. Dickens, Homer (1990 edition [First published 1971]). The Films of Katharine Hepburn. New York City, NY: Carol Publishing Group. ISBN 0-8065-1175-3. DiEdwardo, Maryann Pasda (2006). The Legacy of Katharine Hepburn: Fine Art as a Way of Life: A Memoir. Bloomington, IN: AuthorHouse. ISBN 1-4259-6089-8. Edwards, Anne (1985). A Remarkable Woman: A Biography of Katharine Hepburn. New York City, NY: William Morrow & Company, Inc. ISBN 0-688-04528-6. Haver, Ronald (1980). David O. Selznick's Hollywood. London: Martin Secker & Warburg Ltd. ISBN 0-394-42595-2. ヘプバーン, キャサリン (1991). Me―キャサリン・ヘプバーン自伝. New York City, NY: Alfred A. Knopf. ISBN 0-679-40051-6. Higham, Charles (2004 edition [First published 1975]). Kate: The Life of Katharine Hepburn. New York City, NY: W. W. Norton. ISBN 0-393-32598-9. Horton, Ros and Sally Simmons (2007). Women Who Changed the World. London: Quercus Publishing Plc. ISBN 1-84724-026-7. Kanin, Garson (1971). Tracy and Hepburn: An Intimate Memoir. New York City, NY: Viking. ISBN 0-670-72293-6. Mann, William J. (2007). Kate: The Woman Who Was Hepburn. New York City, NY: Picador. ISBN 0-312-42740-9. Dickstein, Morris (2002). "Bringing Up Baby (1938)", in The A List: The National Society of Film Critics' 100 Essential Films, ed. Jay Carr. Cambridge, MA: Da Capo. ISBN 0-306-81096-4. Prideaux, James (1996). Knowing Hepburn and Other Curious Experiences. Boston, MA: Faber and Faber. ISBN 0-571-19892-9. Verlhac, Pierre-Henri (2009). Katharine Hepburn: A Life in Pictures. San Francisco, CA: Chronicle Books. ISBN 0-8118-6947-4.